The Toluna community offers our members a chance to create their own content and get feedback from our millions of members. 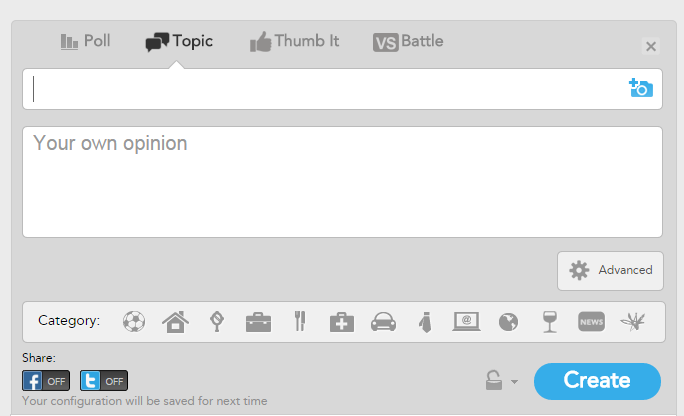 Our content creation platform offers our members to create Polls, Topics, Thumb Its and Battles. In our series of “Toluna Essentials” we’ll go over all the techniques you can use to get the most out of your content at Toluna. The second in our series is the “Topic” option. What is a topic? By definition, a topic is a subject of conversation or discussion. Topics are generally made by asking a question in the subject line and then adding a few more words of explanation or follow up questions in the “your own opinion” section. Perhaps you want multiple opinions on buying concert tickets. Adding photos or videos to the entire topic is quite simple. 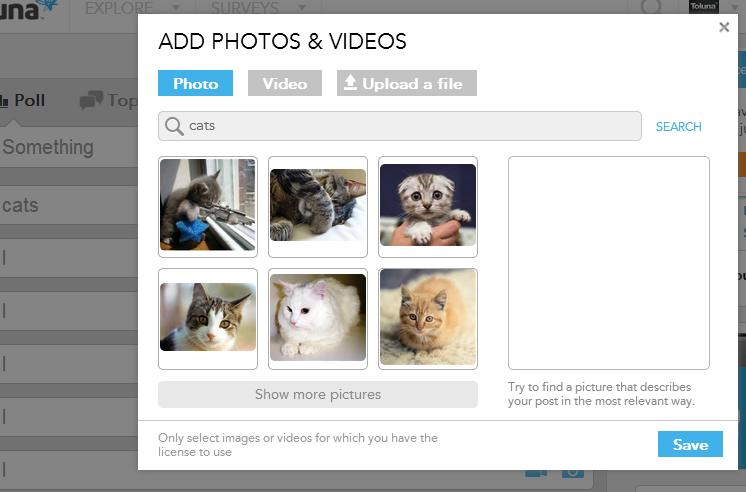 Just click the camera icon, or video camera icon and upload your own photos, or use our search tool. *Quick Tip* Topics that include a photo or video tend to be more interesting to members than ones that do not include this feature. In fact, our Toluna Team members may even send you some bonus points. By clicking the “Advanced” options button, the picture above will drop down. Our advanced options allow you to choose the timeframe you would like to keep your poll open (1 month, 3 months or 6 months, or Forever). Your topic will close automatically after 6 months if you do not choose an option. Once your topic is launched, you can view the results by going to your profile, scrolling down to “Your Content”. Thanks for reading a bit about Toluna, and we look forward to bringing you more information next week!